Listing courtesy of Buchan R E Group LLC. Issaquah is a city on the Eastside of the Puget Sound region, found along the I-90 corridor to the east of Bellevue. More than 30,000 people live in this affluent suburb, which is one of the more desirable places in the area to call home. A good school system, wonderful parks and trails, and a vibrant business community all make Issaquah an attractive target for real estate buyers. Browsing the MLS listings for properties in Issaquah shows that there are a variety of housing types on the market. There are single family homes in the area, but there are also plenty of townhomes, condos, and apartments as well. As with most locations on the Eastside, Issaquah real estate comes at a premium, with average home prices frequently topping $500,000. One of the great things about Issaquah is the easy access to the outdoors, including the three large parks within the city – Tiger Mountain, Cougar Mountain, and Squak Mountain. Each of these parks offers trails for hiking, in addition to some impressive vistas from various locations within the parks. Tiger Mountain is a particularly large park, and is notable for the paragliding that takes place from the west side of the mountain and is often visible from the city. Adjacent to other upscale communities like Sammamish and Newcastle, the location of Issaquah is another element that residents love. It is an easy commute in to Bellevue, or even Seattle, from this quiet suburb. Also, the south end of Lake Sammamish is within the city limits, providing residents access to this large body of water for boating and other recreational activities. For those into skiing, I-90 provides a quick drive up into the Cascade Mountains to the Snoqualmie Pass Ski Area. 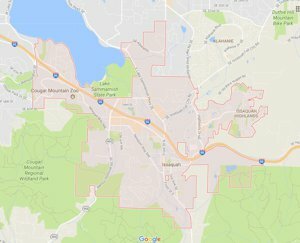 Issaquah has been growing in recent years, and the real estate market in the area is a prime example of that. Prices and competition remain high, so tracking the listings and acting quickly is essential to landing the perfect property in this wonderful community.